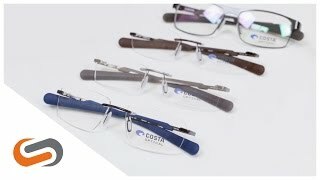 Costa Seamount 100 prescription glasses from the all-new Costa Optical line showcases a rimless design that provides an uncompromising field of vision. Complemented with a strong and smooth titanium construction, the Seamount 100 is a classic-clean, sleek pair of prescription glasses. Non-slip Hydrolite temples work to keep the frame in place in any environment. Feel like you're wearing nothing at all when wearing a pair of Costa Seamount 100 prescription glasses.